Prime Minister Alexis Tsipras and leader of Greek Orthodox Church Archbishop Ieronymos met on Tuesday afternoon ahead of the crucial Constitutional Revision. The poilitical and spiritual leaders of Greece agreed to set up a Joint Fund for the Exploitation of Church Property. Furthermore, they seem to have agreed on the Constitutional revisions with regards to religious issues. 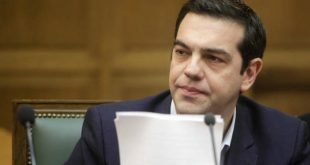 “The constitutional revision will aim to upgrade Church’s autonomy and emphasize its unique contribution to birth of Greek state,” Tsipras said in a joint appearance after the meeting. Archbishop Ieronymos thanked the Greek government after receiving assurances that the Greek Orthodox Church will remain the country’s “prevailing religion” after the constitutional change. The two leaders focused on a Joint Declaration that settles some administrative issues like the priests’ salaries and a Joint fund for the management of the Church assets. 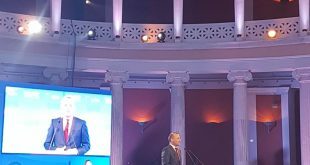 “Today we set the framework for the settlement of historical issues for the benefit of both sides but also to strengthen the autonomy of the Church of Greece towards the Greek State,” Tsipras said. “If all this economic possibility proceeds and the Church becomes free and gains its autonomy it will be written in the history that you are the first to put his signature,” Archbishop Ieronymos responded. Creation of a Joint Fund for the exploitation of the Church Properties. The fund will be managed by a five-member board. Two members of the Fund will be appointed by the Church of Greece, two members appointed by the Greek Government, and one member will be appointed jointly. The Ecclesiastical Property Development Fund will undertake the management and exploitation of the property that has already been disputed between the Greek State and the Church of Greece since 1952, as well as any property of the Church that will voluntarily grant to this Fund. 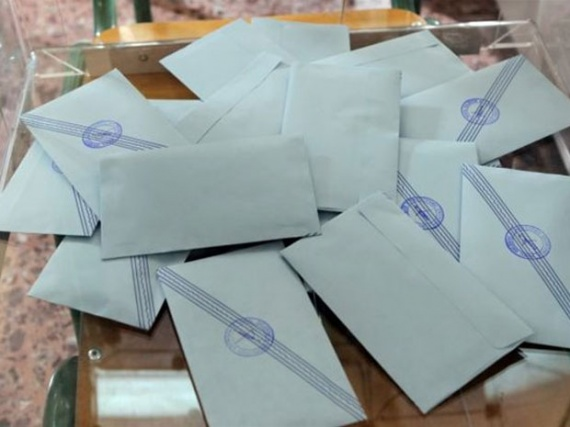 Orthodox priests will stop receiving state salaries, but an annual state “subsidy” will be allocated to a special fund managed by the Church of Greece. 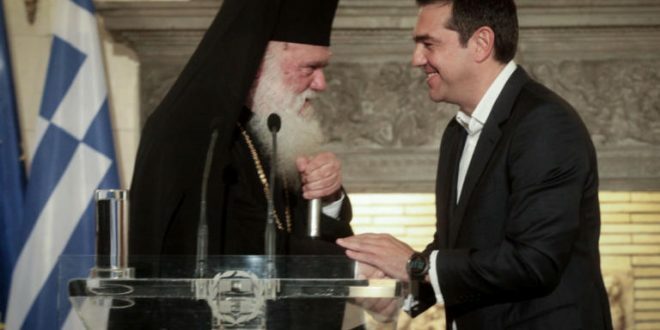 Tsipras assured the Archbishop that the forthcoming Constitutional Reform and in particular the changes in Article 3 are aimed at upgrading the distinct role of the Church, enhancing its autonomy while recognizing its significant contribution to the birth and formation of the Greek state. 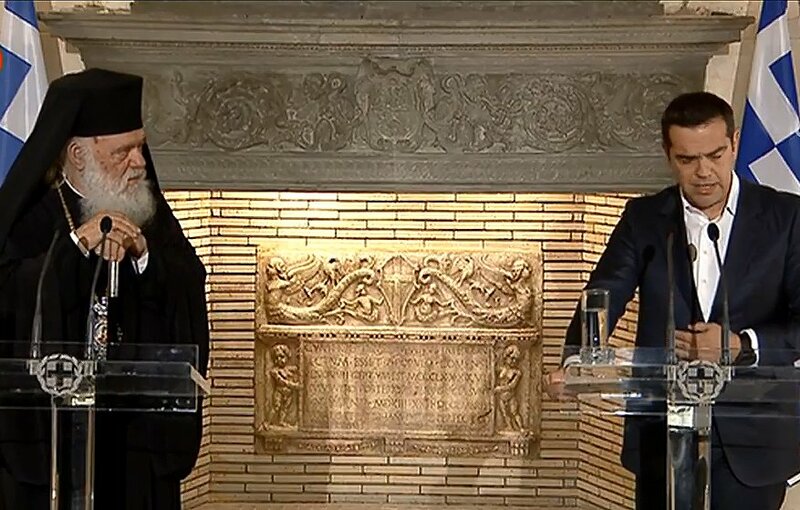 “The proclamation of the religious neutrality of the Greek state ensures, on the one hand, the distinct roles between the State and the Church and, on the other hand, guarantees cooperation between them on issues of common interest,” the prime minister said. These claims were brought by New Democracy MP Makis Voridis who also claimed that Greeks will not be able to celebrate Christmas in public or set up Nativity scenes. Relations between atheist Prime Minister and Church of Greece …sealed with a kiss.